It has been a whirlwind of activity as of late at the hälts headquarters. As Spring nears so too does hälts begin to awake, coming out of rather long winter hibernation. I have lots in store for the month of April including my first hälts POP Shop and live art performance happening in the City of Calgary….and also worldwide as I will be doing periodic live broadcast throughout the event. I will keep this introduction short and sweet by getting right to the point of the matter. Below is information regarding an art event called hälts Pop Shop and Project Reclaim, it is a free event to the public, and runs the course of three weeks starting April 1 through to the 20th. The event kicks off with a live art performance and multimedia installation called Reclaim. 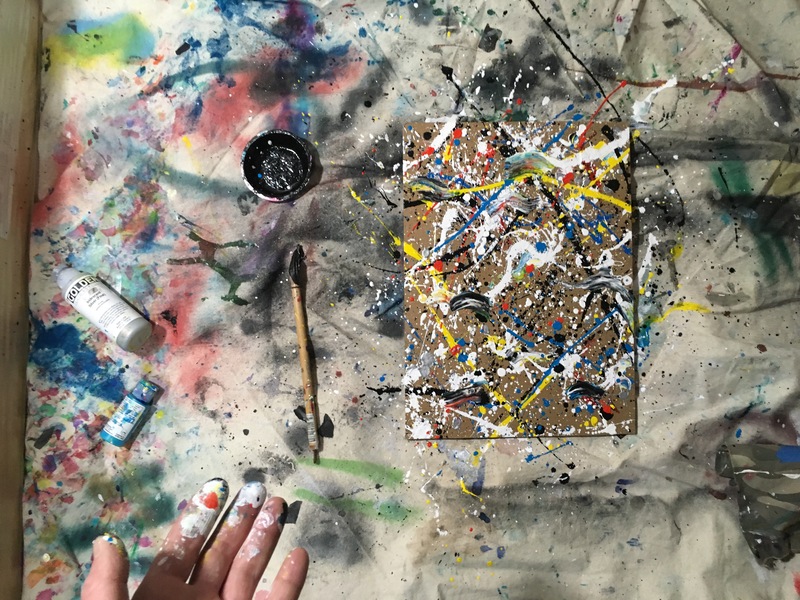 This is an interactive live art experience facilitated by hälts with the intention to present an art experience that both introduces my art and process to the city of Calgary while also encouraging public interaction, and connection. In doing so I am creating a space to celebrate the human spirit. 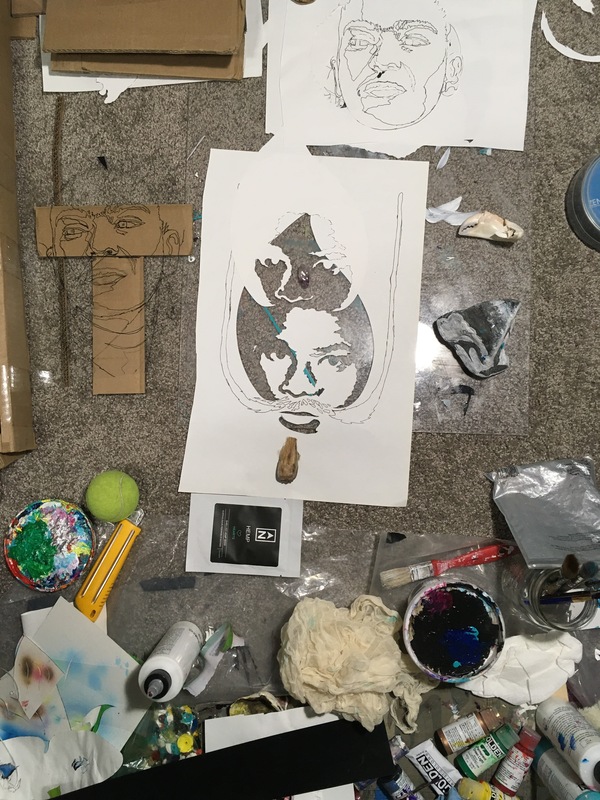 Hälts will be introducing himself and his art to the community of Kensington at Small Space Gallery starting April 1 in a one-week performance multimedia installation. This will be followed by a 2 week hälts Pop Shop and mini art gallery April 8-21. Hälts will be in attendance for the duration of the event. Please refer to schedule on right hand side. Visitors are welcome throughout the event! Shane Haltman is a devout multi-spectrum contemporary artist. Haltman’s work deals with the human condition and represents a search for the meaning of life through art. Shane has been on a lifelong quest, exploring visual communication through an intuitive self-taught process. 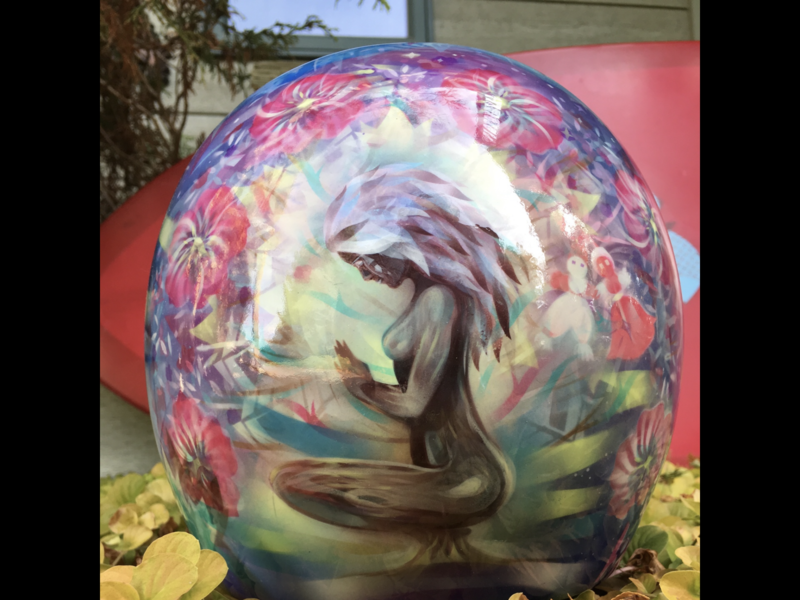 His work is vibrant and bright, reflecting an inner spirit that finds solace in a studio working. In his work, he offers a place for the viewer to wander freely, and explore the layers both of paint on canvas, as well as within themselves. Through his eyes the world is a vibrant dance of colours, shapes and things. By weaving several seemingly incompatible worlds into a new universe, Shane uses a visual vocabulary that addresses many different issues we face in the modern world. Preferring the title of experiential artist, he has traveled to magical and remote places leaving behind permanent mural installations. Shane received a BA in Geography from the University of Calgary and has spent his other time working as a film technician. Common themes in his work are ancient mythology, literature, dreams, Nature, city life, art history and film. Shane currently lives and works in Calgary. ‘I built this city from my imagination’ hälts drawing from the black lodge book. of drawings. designer by night….new stuff coming for my website launch…coming this April! 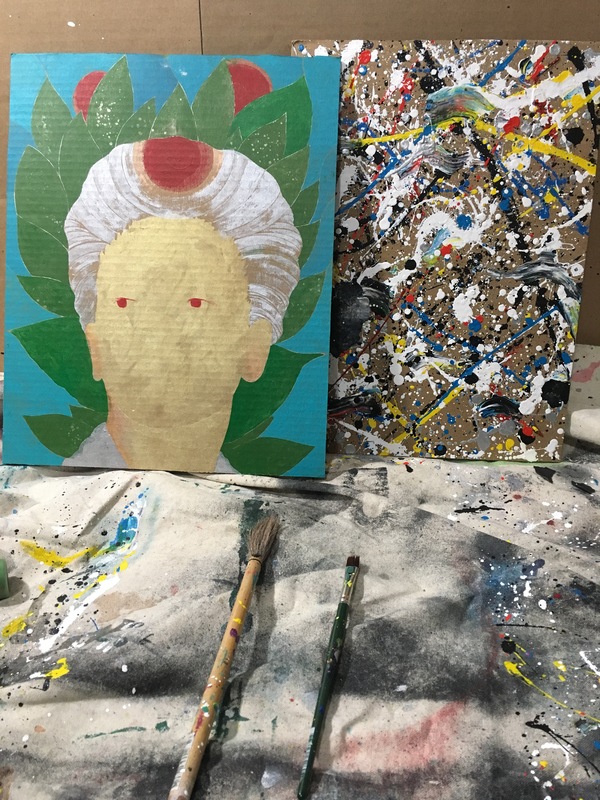 Tags: albertaart, aprilarteventinCalgary, artist, artperformance, artprocess, behindthescenes, Calgary, Calgaryart, canadian art, Canadian artist, comedy, haltsPopshop, life, liveart, Mahaloness, ninja, painting, pinter, yycart | Permalink. The spirit of the universe responds to action -wrote this in my notebook sorry I don’t have a source nonetheless truer words have never been written. It has been full on lately in the studio working on various recycled cardboard WIPs and keeping the dream alive. I live in a place where art is one of those things treated as a luxury item so making art that is meant to elate and spark thought, feeling and promite healing seems like an endless uphill climb! This is why it is important to keep focus on the work and to not let these doubts and thoughts threaten the mission. I decided many years ago to develop my art and with the intention of doing it for the rest of my life, and this has not changed to this day. Sure I have had my fair share of setbacks and sometimes the valleys have been deep. I have managed to always find the jewel of wisdom in each and every one of my experiences, even if it takes longer than I would like, this has been vital in keeping my art positive, and sticking to my intentions of bringing wellness, good vibes and peace into this world. 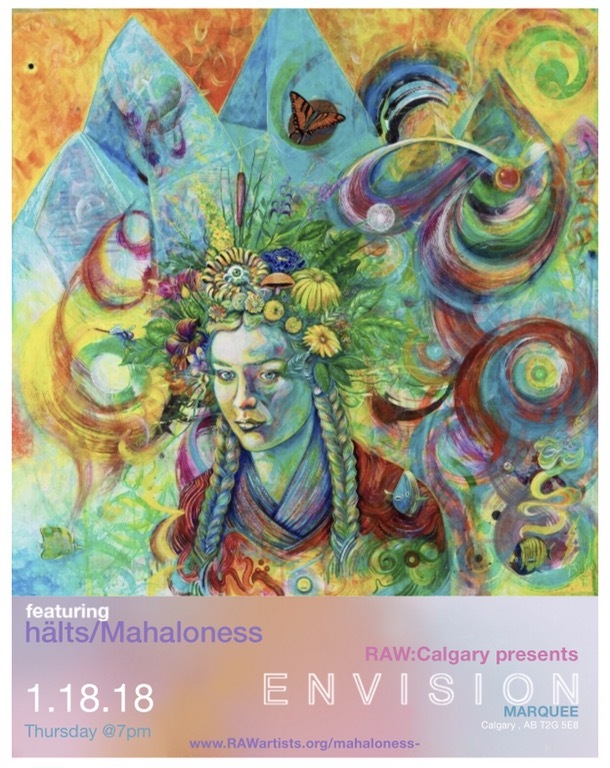 I invite you to a fun night filled with a diverse range of talented Calgary based artists from art, music, hair/make-up, film, and more, all happening Thurs. Jan. 18th at the Marquee Room, it is a licensed event, 7pm-1 am, any questions please fire them my way and I will be happy to help💛❤️💚 I will be live painting and I will have a nice assortment of artworks, hope to see you there! It’s a great date night! 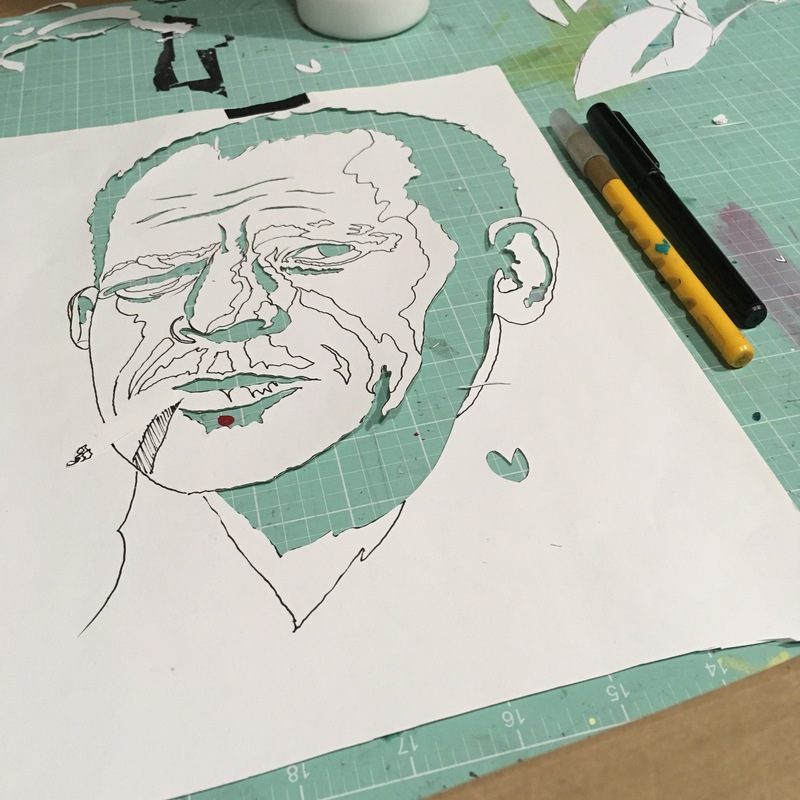 recycled cardboard WIPs are coming along nicely! Yew! 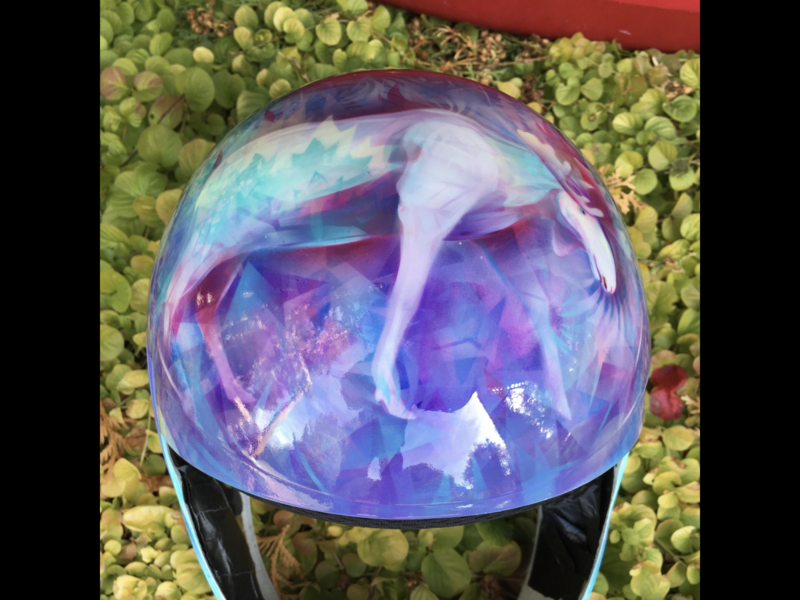 💛❤️💚 and lastly an exciting development is this helmet which I painted for Canadian Olympic skeleton athlete hopeful Mirela Rahneva, my helmet art will be featured in publications across Canada and on CBC, I am very honoured and stoked to be a part of this wonderful story, more on that as things develop! 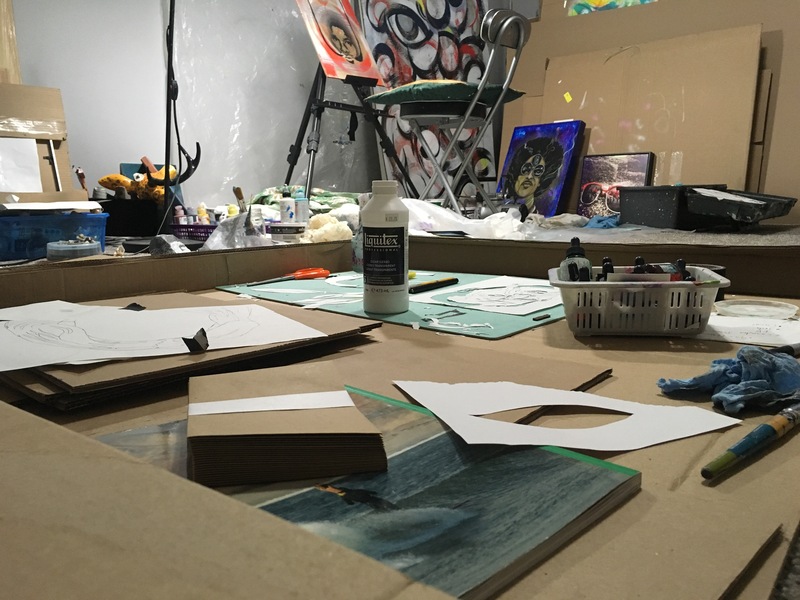 Tags: action, airbrush, airbrushart, art, artiststudio, artprocess, behindthescenes, Calgaryart, canadapress, CanadianArt, Canadianartist, CBC, contemporaryART, documentary, envision, halts, helmetart, life, Mahaloness, minimotion, moose, painter, painting, rawartists, skeleton, spirit, universe, winterolympics, yycart | Permalink. 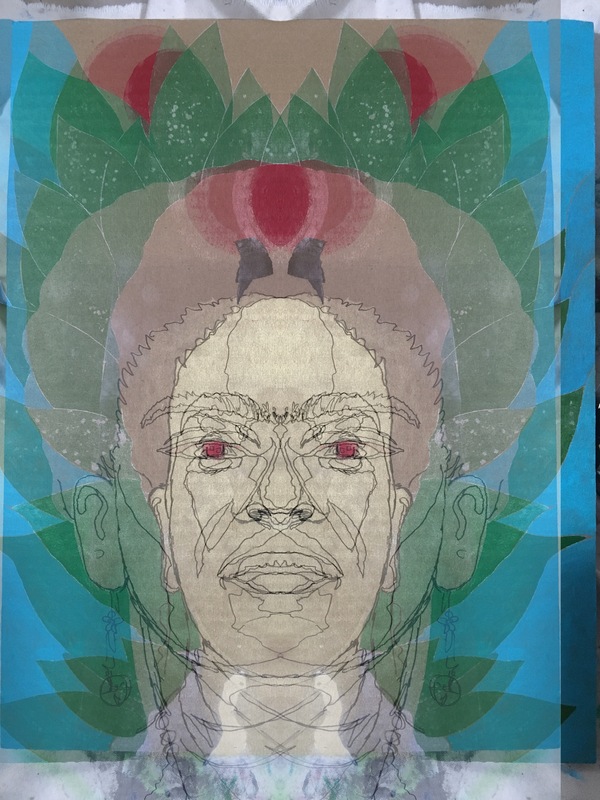 Began a new project just recently, a mural installation called “Creator’ based on a vision that sparked my imagination. 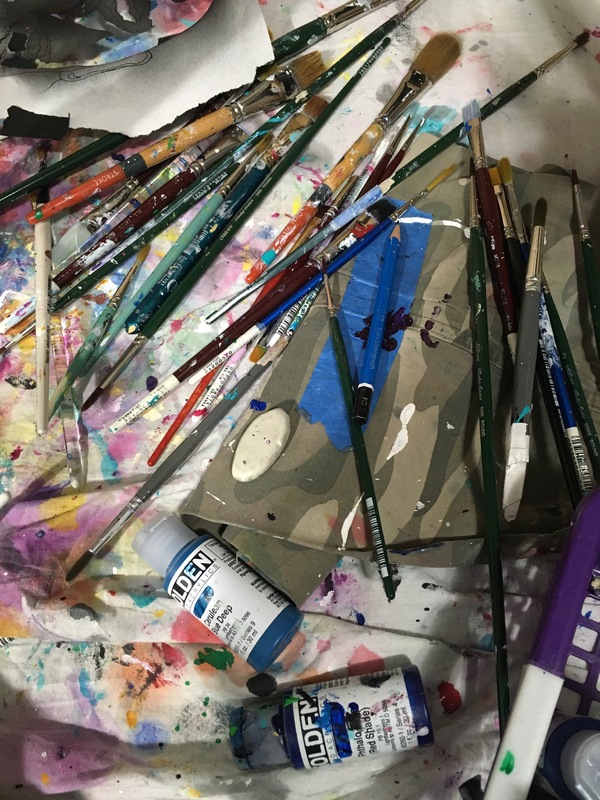 The process is a lot of work, a lot of hustle and bustle, late nights, mixing paints, drawing, cleaning, running, music, drink water, look, step back, never look back, eat, drink, spray, brush, clean, sleep when the legs turn to jello…just one more session, okay and maybe another. This is the thing that makes me happy, I put a lot of care an attention into my murals, some take 3 months to do, some a day or two, it just all depends on mood, constitution, atmosphere, nerve, intuition, flow, and juice. When these elements are aligned it is magic in its purest form, and so far this project is all of the above. It is dedicated to a friend named Scotty who moved onto the next life and whose words of encouragement helped me to carry on, Eddie and Clyde Aikau (so inspiring), all other surfers and ocean lovers, and to people of Earth, as we all are here because Creator, who ever that is to you, made this existence and this planet, and the Cosmos and what a tremendous gift it is to be able to be a part of it all. Many thanks to New Age Calgary, Rebecca, Nicole, my family, Yvan, John, Guy, Mark, Leigh (who lent a projector, very cool and fun), Sunnyside Art Supply, the Roasterie, Sunnyside Market and all the folks who have contributed in one way or another, couldn’t do it without your help, love, food, coffee, smile, hug, laugh, thumbs up, and positivity. More coming soon my friends, if there is any questions or comments please let me know and I will do my best to get back to you. Until than I have a few more sessions on this beauty, and I am excited to say that I am making a movie which I will hopefully be completed sometime in March, I will post more on that soon. I leave you with some pictures and a few more words. Full Spectrum visible colours, colors, couleurs!!! the office for the next little bit. Keep working on your dream, if you have been thinking about it for sometime it is never too late, it is there waiting for you to begin at any moment. You will not be sorry you did. Tags: Aikau, art, artprocess, Calgaryart, Canadianmuralartist, Creator, dream, flow, hältsART, heart, inspire, life, love, magic, Mahaloness, mural, muralmaking, ocean, painting, roasterie, sunnyside, sunnysideartsupply, thankyou, yycart, yycmuralartist | Permalink.